Opportunities and orders can be added to the forecast both manually and automatically. 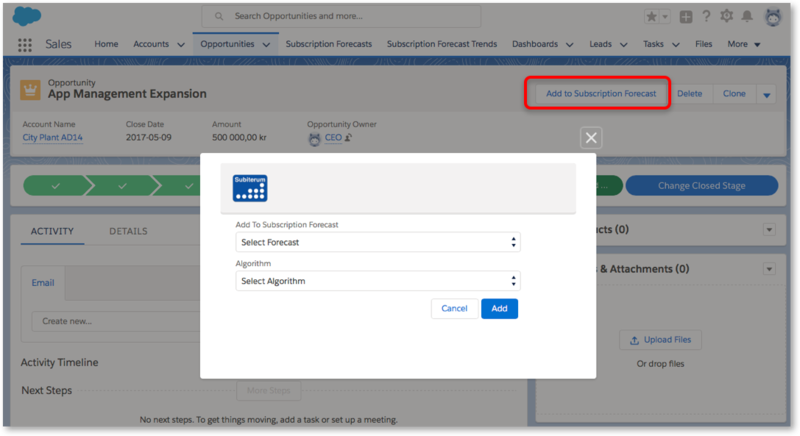 To add an opportunity manually to a forecast from the opportunity or order page, use the “Add To Subscription Forecast” button and select a forecast and algorithm. Your default forecast and algorithm are pre-selected. Opportunities with probability = 0% can not be added and if an opportunity is updated to probability 0% it gets removed from the forecast. Opportunities and Orders can also be added in bulk from the “Multiple At Once” page. You access this page from the bottom section on the Subiterum Setup page. You can filter the search in the top section and then add one or many Opportunities/Orders at once from the results shown on page. Use the “All at once” button if you want to add all Opportunities/Orders meeting the filter criteria in one go. “All at once” processing will run in the background and one complete you will receive an email notification. Forecast values can be entered and adjusted on the “Forecast Line” page using the edit button on a line. Values can be changed both individually or multiple at once through the adjustment tools at the bottom section in the pop-up. The decimal granularity in this pop-up is controlled by the FormatInput application setting. The line level menu provides capabilities to hide/show line, analyze line, remove from forecast and update Opportunity amount. summarises the forecasted values for the opportunity across all forecast objects into a summary amount. Actuals are used when present. The number of years being summarised is configurable in the UpdateOpportunityAmountFromLine application setting. Summary starts at opportunity close date. Opportunities with products get their total amount from the sum of all products and it is read only. “Update Opportunity” menu option is not displayed for these. Changes made to opportunities with product lines are propagated into forecasted values even when UpdateOpportunityAmountFromLine=Yes. “Analyze Opportunity” shows the current forecast compared to previous forecasts to show how forecasted values have changed over time. Each forecast line can store “actual” values in addition to the forecasted values. Actual values can be entered by users with permission set “Subscription Forecast Admin” or “Subscription Forecast Edit Actuals”. Actuals can be entered either line by line using the line level “update” popup or by selecting “Actuals: Current Fiscal Year” to update columns or full grid at once. The Forecast Trend page compares values from current month with values from previous comparison periods. Forecasted values are copied into historical snapshots on a weekly/monthly/yearly basis depending on configuration. Snapshots can also be created manually by admins using the button on the Forecast Trend page. Snapshots from previous periods are kept for one month after which they are deleted except for first snapshot from every month that remains. Previous period defaults to the most recent historical snapshot and you can manually select any previous period for comparison. You can hide lines from being displayed and users with admin permission can also save a filter for what gets hidden by default. You can toggle between a monthly and quarterly view using the icon at top right corner of table. All Recurring filter in the forecast objects drop down list summaries all values for “Recurring” forecast objects. Annual Recurring Revenue shows the monthly recurring revenue normalised to a yearly value by multiplying it with 12. The thresholds for red and green colors are configurable as application settings. The underlying data is the same as for Forecast Line page which means a user only sees values for opportunities, orders and subscriptions that are accessible. 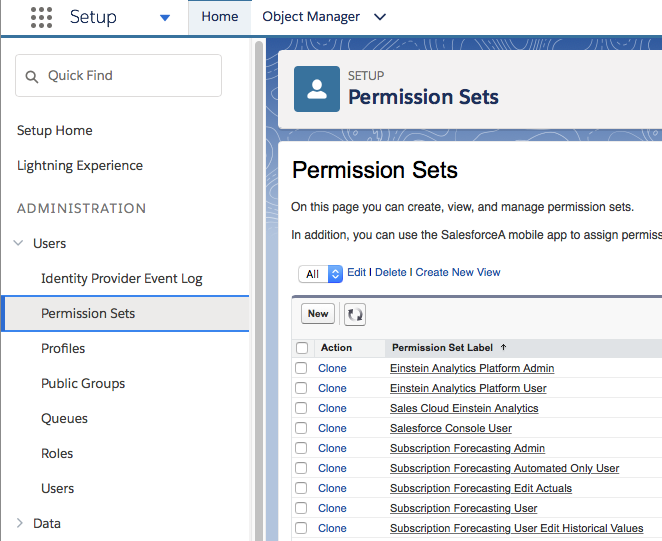 All Salesforce users that should access the application need to have a license assigned and one or more of the below subscription forecasting permission sets. Note that this admin permission gives users full access including deletion of forecasts so use it with care. 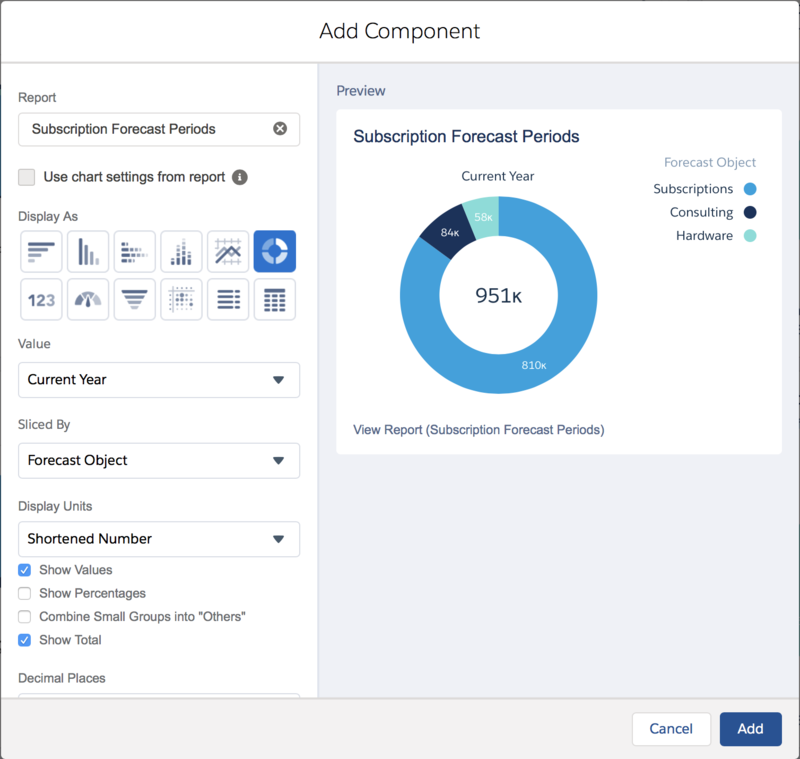 Subscription Forecasting User: Cannot define forecasts, objects or algorithms. Cannot edit actuals or historical forecast values. 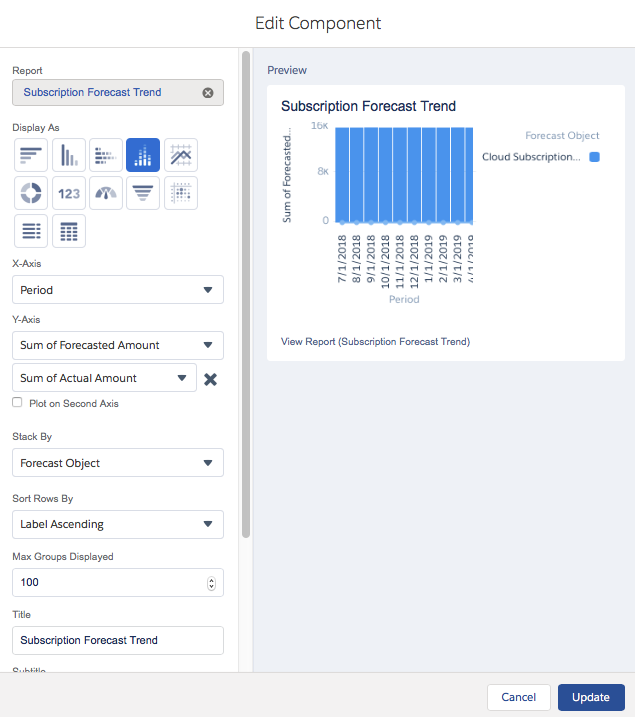 Subscription Forecasting User Edit Historical Values: Same as subscription forecasting user and permission to also edit historical forecast values. 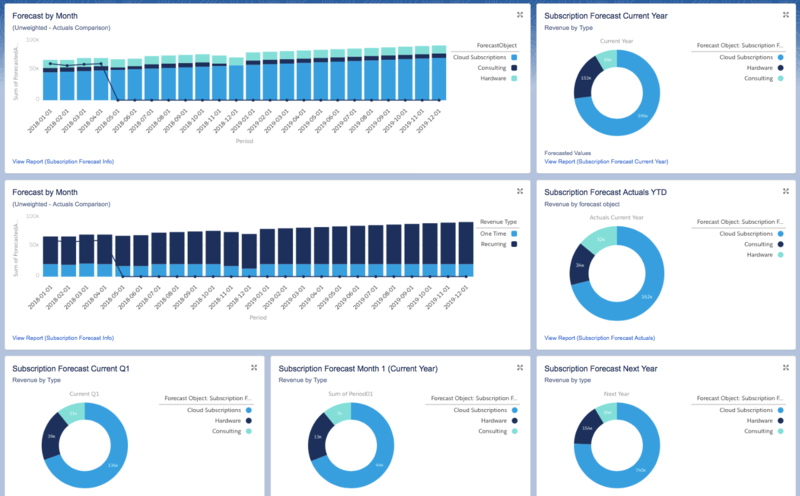 Subscription Forecasting Automated Only User: Cannot define forecasts, objects or algorithms. Can not enter forecast values manually, edit actuals or historical forecast values. In addition to the above user permission sets the following add-on permission sets can be added to give users additional permissions. Subscription Forecast Edit Actuals: Added to user who should be able to edit actuals values. The application allows you to define your own revenue types as forecast objects and algorithms to distribute revenue over time. Define one or more forecasts as suitable for your organisation. Each forecast has a set of forecast objects linked to it (lines for each opportunity/order). Defining a forecast as “Default” means it will be used for opportunities and orders that are automatically added to a forecast. Only one forecast should be set as default. See further details in automated forecasting section. The seasonal variation percentage is applied when opportunities and orders are added to forecasts. Defining a forecast as type=Budget enables you to easily compare budget vs forecast in reports. You can create “Subscriptions” and add those your Budget forecast as an alternative to the Opportunities/Orders going onto your regular forecast. Detailed step-by-step instructions are found here. A complete forecast with all its lines can also be copied into a “budget” forecast using the line level button to facilitate “what if ?” scenario plannings. A forecast object represent a revenue type that can be forecasted for opportunities and orders. Each forecast object added to a forecast results in a separate line of values for each opportunity/order. Examples could be “Cloud Subscription ” Professional Services, “Service Contract”, “Maintenance”, “Application Management”, “Product Segment A”, “Product Segment B” etc. ALGORITHM ATTRIBUTION % controls how values are distributed across forecast objects for opportunities without products. “Cloud Subscription Growth” will get 100% of the amount when opportunities are added to this forecast. “Cloud Subscription Growth” and “Cloud Subscription “will get 50% of the amount each. Algorithm attribution values are treated as individual weights. If three forecast objects each having algorithm attribution=50 would be used on a forecast the three corresponding forecast lines would get 1/3 of the amount each (50/150 = 33.33). SEASONAL VARIATION: is used when opportunities or orders are added to forecasts. The seasonal variation pattern is defined on forecast level. CODE: used when products and/or product families are mapped to forecast objects. Algorithms define monthly revenue patterns that control how opportunity and order amounts and sub totals get distributed over time when added to forecasts. An algorithm defines monthly percentages to be applied for each month starting from the opportunity close date or order start date. An algorithm to implement a “linear 12 month” amount pattern would have 8.33 (100/12=8.33) as the monthly value for each of Period01-Period12. An algorithm to implement full opportunity amount in the closing month would have 100 in Period01. Defining an algorithm as “Default” means it will be used when opportunities without products are automatically added to forecast. It will also be used as fallback algorithm for opportunities and orders with products if a product lacks mapping to algorithm. Only one algorithm should be set to default. You need to define at least one algorithm in the system but it can have all 0 values in the event you do not want any values to be populated by your algorithm. The opportunity close date/order start date is included in prorated amount i.e. if close date is first day of a month, the full month will be forecasted. If the application setting ContractLimitsEnabled has been set to “Yes” proration is also being applied based on contract end date. The contract end date is included in the prorated amount i.e. if the contract end date is last day of month, the full month will be forecasted. Products and/or Product Families can be mapped both to algorithms (distributing revenue over time) and forecast objects (lines on forecast) to automatically get revenue distributed as appropriate. You configure the product mappings in the SubscriptionForecastMapping application setting (Custom Metadata Type). 1. Define a product family for your hardware products and map it to a forecast object for hardware and an algorithm placing full amount in first month. 2. Define a product family for your 12 month subscriptions and map it to a 12 months algorithm and a forecast object for subscriptions. Result: When products in these families are added to opportunities or orders the respective product line sub totals will automatically show up on different forecasting lines with revenue distributed correctly over time driven from the product family mappings. Note: Product Code is the basis for the mapping logic. Products must have a product code defined for mapping to work. Note: The Product Family API name is the basis for mapping. Make sure to use the the API Name in your mappings. 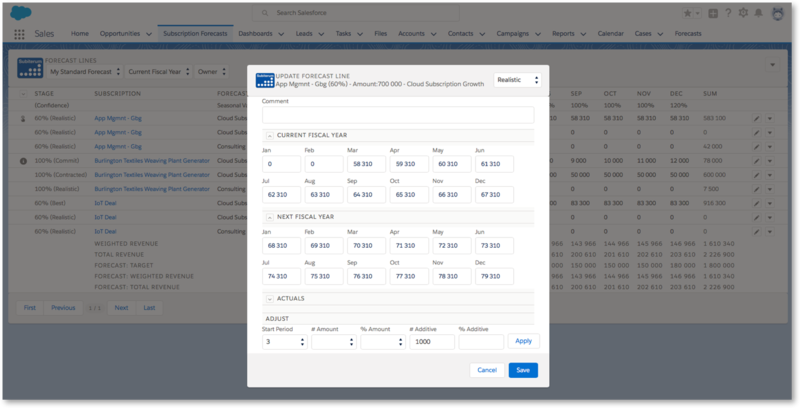 The automated forecasting engine controls how and when forecast values are created, updated and deleted driven from the salesforce opportunity and order entities. The behaviour is controlled by configuration on application, forecast, forecast object and algorithm levels. Automated add/remove from forecast can be enabled/disabled by the AutoAddOpportunitesToForecast and AutoAddOrdersToForecast application settings. When opportunities or orders are added to a forecast their respective close date/start date becomes the initial month from which the algoritm starts applying values. For opportunities without lines, the opportunity amount is the base line for the algorithms. Opportunities and orders with product lines base the logic on the individual line dates and totals. The seasonal variation pattern defined on forecast level gets applied on the values derived by an algorithm. When an opportunity or order is updated, changes to opportunity close date, order start date, opportunity/order amount are automatically reflected into the forecasted values. B. Opportunity amount decreased by 25% => forecasted values reduced by 25%. This percentage based adjustment means any manual adjustments to values remains but adjusted with same percentage as original opportunity amount. C. Product lines are added/removed/changed on opportunity/order => forecasted values are recalculated. Forecast rows with only zero values are automatically deleted in the background on daily basis at midnight. The are suitable for different types of dashboard components including the ones below. Add a dashboard components to your dashboard. The Subiterum report types contains lookup fields from Opportunity and Order objects for use in reports. To add additional fields, including custom fields, you can “clone” a Subiterum report type into your own and then modify that one based on your needs. Step-by-step instructions for how to configure and report on Budget vs Forecast vs Actuals can be found here. The Setup page is only available for admin users. Application Settings to control general capabilities. See next section for details. Can be used to populate the application with basic configuration data as a fast way of getting started. Basic data can then be modified to fit your needs. Controls if Opportunities should be automatically added/removed to forecasts when Opportunity. Probability crosses the AutoAddOpportunitiesThreshold. When an Opportunity is created or updated making its Probability % go above this threshold the Opportunity is added to the Default Forecast using the Default Algorithm. When an Opportunity is deleted or updated making its Probability % pass below this threshold the Opportunity is removed from Forecast. Controls if contract end date should be taken into consideration when values are created from algorithms. 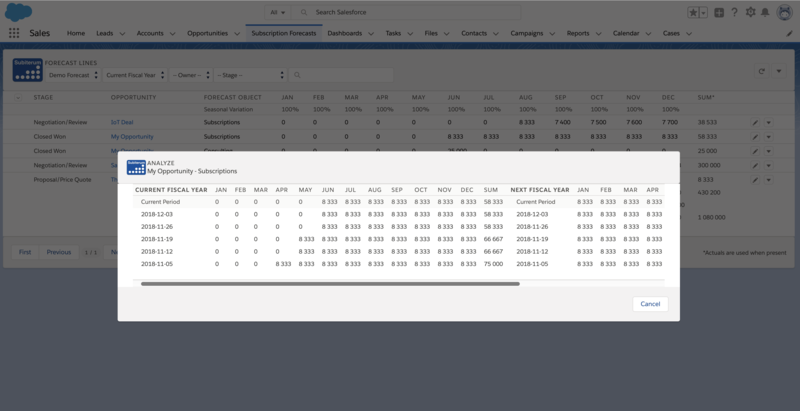 Controls if forecasting data should be duplicated into the subsfor__SubscriptionForecastLineInfo__c object to simplify creation of certain reports (SubscriptionForecastTrend). This setting can be used for turning off data population into this object which saves a significant amount of storage in your salesforce organization. Controls if the Subscriptions menu option should be visible in the application. Defines the format used for values displayed on the forecast line page. Defines the format used by input fields on the forecast line page. Controls how often history snapshots are taken of your forecast lines. Controls if all lines visible for a user get loaded into the line and trend pages or if lines are loaded owner by owner. Set this setting to No if you have large volumes. Controls how many fiscal years that are visible in UIs. Valid values are 1-4. Forecast Trend UI: Green highlighting threshold. 10 means that all current period summaries with >10% increase than previous period summaries gets highlighted in green. Forecast Trend UI: Red highlighting threshold. 10 means that all current period summaries with <10% decrease from previous period gets highlighted in red. Controls if Opportunity amount can be updated from Forecast Line UI for opportunities without product lines. Number of years included when forecasted values are summarised to update Opportunity Amounts. 1 year means 12 months from Opportunity Close Date. For opportunities with a close date earlier than current fiscal year the start date of current fiscal year is used. Controls which confidence levels that are enabled for selection in the update forecast line popup, their label and display order. Controls the values available in the tools section of the update forecast line popup. Add, remove, change records to implement the values suitable for your business. Mappings from products and product families to algorithms and forecast objects. See product based forecasting. Note: Mappings are case sensitive. The application leverage the fiscal year settings of your organisation. Your fiscal year start month becomes the first subscription forecast period. If you update you fiscal year settings the subscription forecasting data will not automatically follow that update. The period headers (JAN, FEB…) will change based on your fiscal year settings but the data in the respective column will not move or change. This means no data gets lost if you change your fiscal year but also that you need to adjust your data accordingly in the subsfor__SubscriptionForecastLine__c and subsfor__SubscriptionForecastHistoryLine__c objects. All forecasted values are stored in the corporate currency. Amounts in other currencies are converted into corporate currency when values are created/updated on forecasts. If the application encounters an exception that can not be surfaced without interrupting standard salesforce functionality the error is logged and displayed on the Setup page. Please send us a mail if this happens.